Fan of peonies? Our breeders are in love with them. We introduce you to a few growers of My Peony Society. Leendert (Leen for short) is a businessman, the self-proclaimed king of the metaphors and a gracious host. But foremost he’s a family man. 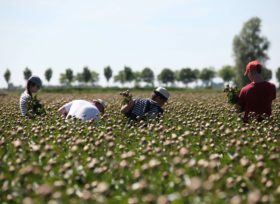 His wife and children, twins Jaap and Joanne, are as peony-mad as Leen is and work with him in the field. One of the youngest members of My Peony Society. Rowin was barely nineteen when he used his savings to buy his first plot of land and began cultivating peonies. His incredible talent makes hard work seem effortless. Travels around the world to study (and grow) spectacular peonies.